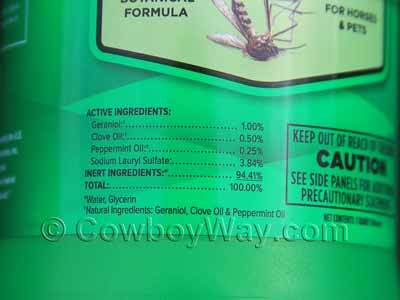 Below is Pyranha Zero Bite fly spray for horses for sale. Pyranha describes Zero Bite as a "natural alternative to traditional fly sprays" that gets its "bug-fighting power" from geraniol, clove, and peppermint. Please scroll down for more information about Zero Bite, including a list of ingredients and our review. 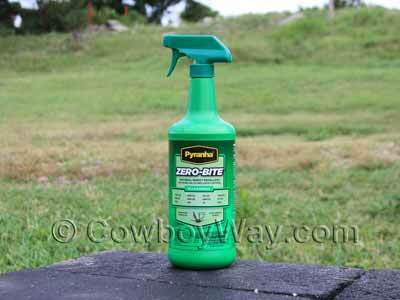 Below: A 32-ounce spray bottle of Pyranha Zero Bite natural fly spray for horses. "Fly Control the way Mother Nature intended. The goodness of natural products such as geraniol, clove and peppermint combined to bring you mother nature’s powerful natural fly fighter." Zero Bite's main active ingredient is geraniol, a substance derived from plants such as geraniums and lemongrass. It is often used as an ingredient in plant-based insect repellents. Here at CowboyWay.com we were curious about Zero Bite. We had used Pyranha's Wipe N Spray with good results, and wondered if their natural fly spray, Zero Bite, would perform well for us, too. Zero Bite worked. It performed well in the pasture for almost an hour. Considering that by "pasture" we mean thick, tall grass belly-high to a 15 hand horse with several ponds nearby, we thought this was a good test of the product. It wasn't perfect: We would like for it to have lasted longer; it wasn't very helpful for horse flies; and a few insects still bothered us, but there were a lot fewer insects than with no fly spray at all. We also have to say that we were surprised it worked better than several cheaper, economy brand fly sprays we used on other horses at the same times on the same days. We do like Pyranha Wipe 'N Spray a little better: It seemed to have a slight edge in how long it lasted as well as how well it repelled horse flies when compared to Zero Bite. However, we still have to say we were pleasantly surprised in how well Zero Bite, described as a "natural alternative to traditional fly sprays" by the Pyranha company, performed in tough conditions. Below: A 32-ounce bottle of Pyranha Zero Bite showing the ingredients. We know it's hard to read...you can see a list of the active ingredients higher on this same page.